Development approval is a legal document that Council issues that states that you are legally entitled to build. This usually involves the consecutive steps of both Planning and then Building rules approvals, but in some cases either one or both of these steps is not required. Your Local Council's Planning Department will inform you what approvals are required for your project. Anyone can prepare the necessary documentation, however an Architect (such as myself) can prepare the documents for you in a way that maximises the chance of your projects approval. I will start with your ideas, (and plans or sketches if you have any) prepare a Sketch Design and then draft up a set of documents suitable for approval. Because this is my profession I know the rules and regulations. Years of experience has taught me what the pertinent issues are and how to circumvent problems. I find a get a reasonable income source from clients who have tried to prepare these documents themselves only to be denied approval. I reassess the proposal with them, sort out the problems and modify the submission as required. This next link is part of an example list of documentation problems a client needed to be rectified with the Certifier before Building Rules Approval could be granted. The client had designed the building himself and then engaged a local draftsperson to draw it up. Unfortunately the Client did not have any knowledge of either construction or planning regulations before starting on the project. The draftsman priced the job cheaply and did what was asked. Unfortunately he neglected to inform the Client that there may be a problem with approvals. As usual you get what you pay for. In this case rectifying the list resulted in the development being entirely re-designed as many of the problems were integral to the buildings initial concept. Simple mistakes such as a lack of understanding of Energy Efficiency regulations meant that the buildings window placements and sizes had to be changed. This affected the appearance of the building from the street and so a new Planning submission needed to be made. Since a re-submission was needed the client let me re-design the building from the ground up to avoid any more certification issues. This meant that the building was thoughtfully considered and tailor made to the Clients requirements rather than being an ad-hoc collection of spaces. Planning Approval is concerned with visual issues such as how big the building is, how it is situated on the site and what it looks like. Usually the Local Council assesses and determines if Planning Approval is granted. However, if you live in the Country or if you have a building with a heritage listing, approval from additional bodies may be required. If you live in a Rural area you may be in a bushfire risk zone. If this is the case a separate CFS assessment is required. Bushfire zone Housing design requires specialist knowledge as there are not only additional planning issues to address but also construction detailing issues. Heritage design also requires specialist knowledge. In both of these cases or if there is any other reason why your development may not be approved it is wise to lodge a separate Planning Approval before proceeding with Building rules Approval. In this way the cost of any abortive design and documentation work can be avoided. 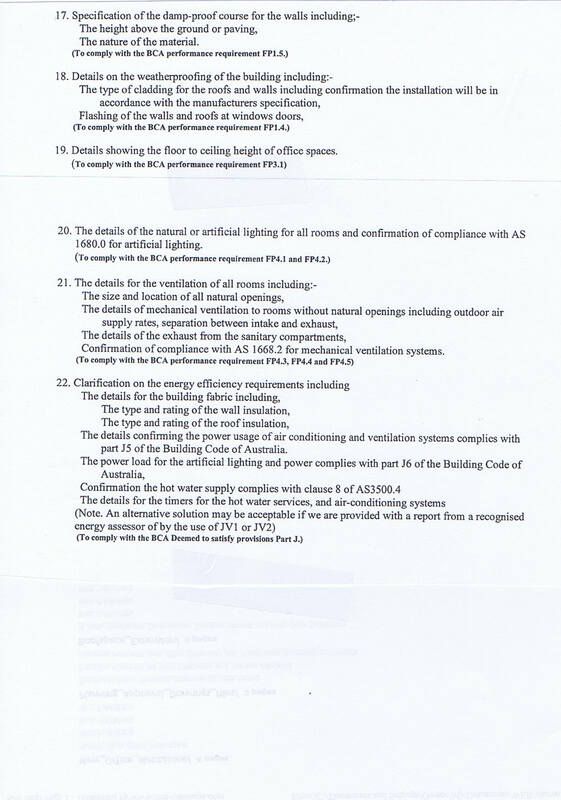 energy efficiency, health and amenity (room-size, and ventilation and daylight criteria). Building Approval is concerned with structural, safety, access, amenity and environmental issues, all of which are contained in the National Construction Code (BCA). A separate more detailed set of drawings, schedules and a specification is produced for this purpose. These are called "Working Drawings" and are the documents the builder uses for construction. A good knowledge of the BCA ensures the documentation will be assesed favorably. Due to the "cut and paste" nature of CAD I can re-use my original planning drawings, deleting and adding notes and details, changing and refining as required. For Residential jobs it is usual for me to employ an Engineer as a consultant fat this stage. It usually costs an additional $1000 to $2000 for these documents depending on how complicated the job is. This includes the price of a soil test. If it is a commercial building other consultants may be required such as service and electrical and hydraulic engineers. It is usual for the Architect to oversee the other consultants and coordinate the project. The other consultants use my working drawings as a base for their work. Due to the nature of CAD their job is simplified and often they may not even need to visit the site. A certifier will assess and grant this approval. The certifier will need to see a set of your Planning approval drawings before issuing Building Rules approval. This is to ensure that the documents are consistant and no significant changes have been made that may affect the initial approval.